Where am I? From a fashion perspective, it looks like Park Ave., but there are no sky scrapers. A vendor walks by with 3 dozen mint juleps in his ‘Ice Box’ crate; I smell an odor of horses and cigars. For one brief day, this town is the queen of the fashion world and the King of the Sports world – ‘Mission Impazible’ achieved. This can only be the Kentucky Derby, one of the greatest sporting events of all times; where Devil Wears Prada meets ‘Devil May Care’. One of the most fascinating things about the Kentucky Derby isn’t the race itself – but the culture of the Derby. It’s one of the only sporting events in the world in which you put on your best clothes to be a spectator. Think about it, do you see men in football stadiums wearing suits and hats? No. More than likely the only hat they have on their head is the kind that holds two cans of beer and a big straw or one that looks like a cheese wedge. Churchill Downs is filled with fashionable hats, shoes, and dresses. The women are dressed as if they are attending a royal wedding or a ‘Nobel’s Promise’. The men are also dressed in hats and summer suits. 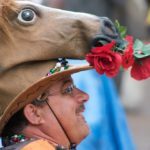 When you put those well-dressed men in colorful sear-sucker suits together with the women in wide brimmed hats and 4 inch stilettos, you have the perfect Kentucky Derby couple. Even Michael Kors would be impressed.